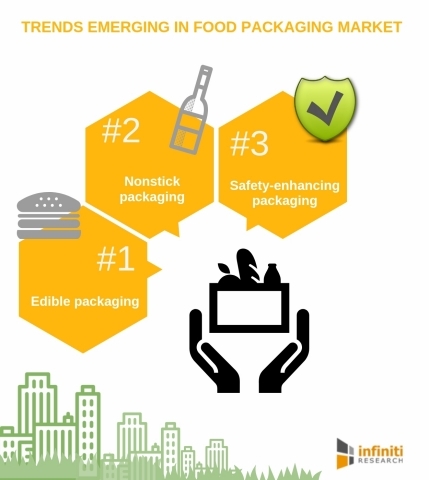 LONDON--(BUSINESS WIRE)--Infiniti Research, a world-renowned market intelligence solutions provider, has announced the completion of their latest article on the trends emerging in the food packaging market. Companies invest heavily in food packaging to lure customers and convince them to buy new products. Packaging is one way for the brand to communicate indirectly to customers. Food packaging plays a prominent role in creating an impression of the product in the customer's mind. Food packaging companies have consistently been searching for new techniques that can meet the changing customers’ perceptions and demands. This reliability has raised the importance of food packaging in the industry. “Many food packaging design firms are working on super compressed packaging to reduce the trouble of carrying home heavy grocery bags and offer more compact and portable packaging to the customers,” says an expert from Infiniti Research. Continue reading to know more about the trends influencing food packaging or request a free proposal. The idea of edible packaging has drawn the attention of many renowned players in the food industry. Growing concerns about environmental sustainability have made them embrace and implement the concept of edible packaging. This transition not only attracts customers but also helps in reducing waste dumping and landfill waste. The only concern related to edible food packaging is that of the health and sanitary standards since the products with edible packaging pass through several touchpoints from packaging to point-of-sale. To know more about food packaging developments and challenges, get in touch with our experts. The prime concern of nonstick packaging is to put the last bit of product in use. This packaging technology is characterized by the presence of a permanently wet and slippery surface and helps liquids to slide off easily. This form of packaging has been approved by the FDA. For more information on the food packaging trends that are going to change the dimensions of the industry, consult with our industry experts. Many instances have been noted where the products that are purchased are spoilt or are unusable. Variances in grocery store policies or damages that take place during transportation are the main reasons for this. Safety-enhancing packaging will help reduce such incidents. According to the latest news, scientists are working on a plastic wrap that is embedded with tiny sensors. Such sensors help detect food spoilage. To access the complete list of food industry trends, view the full article here! Trends emerging in the food packaging market.